Hikvision's DS-2CD4A24FWD-IZH smart IP camera is designed to capture high-quality color images in low-light environments and supports Full HD, high frame rate resolution, WDR, PoE, defogging, 3D DNR and a complete smart feature set, that meets a wide variety of applications. Smart functions combine Smart Detection (intrusion, line crossing, object left/removed, enter/leave area, scene change, audio surge, audio loss, defocus, face and object counting), Smart Codec (smart recording with dual VCA, low bitrate, low latency, ROI enhancement, multi-stream, rotate mode and edge recording), and Smart Image Control, that supports distortion correction. 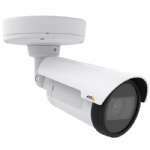 Type: 2 MP CMOS 1/2.8"